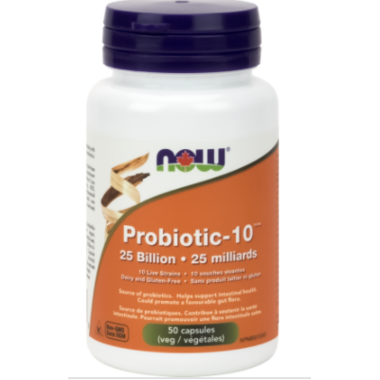 NOW Foods Probiotic-10 25 Billion Veg Capsules offers a balanced spectrum of live organisms consisting of acid-resistant probiotic bacterial strains that are known to naturally colonize the human GI tract. Probiotic bacteria are critical for healthy digestion, help maintain the integrity of the intestinal lining, support proper intestinal motility and participate in the detoxification process. Probiotic-10 utilizes bacterial strains that have been clinically validated for their support of healthy immune system function. This product is suitable for vegetarians and vegans. Adult Dosage: Take 1 capsule daily preferably with or before meals and at least 2-3 hours before or after antibiotics. Keep refrigerated to maintain high potency. I agree with all the reviews. This probiotic works great! I have noticed a significant change in my skin since I've started using these probiotics, they are great. Easy to swallow and no taste. My gut bacteria should be singing its praises! My life has changed for the better since starting NOW Foods Probiotic-10 25 Billion about 2 years ago. No more indigestion, bloating or gas. Great product. I've been using this pro-biotic for about one month and I believe it is helping with my compromised gut. Hoping it continues to work well. Great price, for a high quality product! This alleviates gas/bloatiness within an hour. Great product. Now Probiotic is more effective than Florastor. Florastor does not work for me. So far, so good!! I bought to help with my candida overgrowth. Love that the capsules are small & easy to take, plus I have not experienced any negative digestive side effects (as I have with other brands)! Best probiotic for me, works wonders. It quickly relieved my diarrhea associated with IBS and enabled me to have less symptoms. I use this to help with overall health and to counteract food intolerances I have developed. I no longer experience bloating, gas or painful digestive noises or movements as my food digests! This product came dr. recommended after antibiotics while in hospital. Gentle on the stomach and has put me back on track. I am staying on them for good health. Wonderful product. Works very well. I had bought 2 boxes of another brand prior to this NOW brand because it was on special at buy 1 get one half off price but it was nowhere as good as this one. Actually I saw no benefits. With this NOW brand and higher quality I see some huge improvements in my gastrointestinal problems. Things have improved immensely for me. It takes a few weeks it is not immediate. Thank you NOW for this product. I will continue to buy this one. a reliable brand, reasonable price for high potency. it does reduce bloating. Well, whenever I feel my "gut health" slipping a little I know it's time for a tune-up. The Now Biotic-10 has ten strains of bacteria that we all need, and in a significant amount (25 or 50 Billion cultures). I always notice an almost immediate improvement after taking these. Digestion, bloating, headaches, and more all seem to improve when taking probiotics. The pills aren't too bit and are easy to swallow, and the price is right as well, especially considering the improvement they make to one's health. I highly recommend these to anyone thinking of getting a quality probiotic. Easy to swallow capsule, convenient size. Quality product and wise choice for probiotic supplementation. Great probiotic at a great price! Excellent quality and great price. It's the only probiotic I would consider. I have used this for a few years now and it is the best probiotic I have ever used. It is free of allergens for me. Excellent product. I love that it is free of many allergens. Nearly impossible go find in Canada. I've been using this probiotics. High quantity of probiotics, and it seems to work great on me. Some of my digestive issues have been gone since I started using it. I have been using probiotics since I was 19. I am 53. I swear by them. This product is the perfect one for me and my family. Great service, works fast and lots of numbers....can't get those kind of numbers in a single tablet in Canada. Have used this product for many months now and am very happy with the results. Since I started using this product, I have noted an incredible change in my overall wellness. I once had stomach aches every day and was frequently sick. Since I started taking 1 pill every day with dinner, I haven't had stomach problems at all. Other probiotic pills do work, but this particular one has been most effective!! how many do you take aday.